SANDRINGHAM Dragons were only a kick away from winning back-to-back TAC Cup titles last year, and with plenty of top talent in 2018 – they will be looking to make it three consecutive Grand Final berths. The Dragons produced seven draftees last year, headlined by Andrew Brayshaw – who was drafted by Fremantle with the second pick overall. 2018 will see the Dragons put out a taller team than previous seasons and hold two of the best key position players in the entire 2018 draft pool in the King twins. The Haileybury College students Max & Ben both tower over 200cm and the AFL Academy members will be right in the mix as top five selections for the 2018 draft. Bailey Smith’s superb season across half-back and in the midfield, pushed him into the AFL Academy squad and the Dragons’ 2018 captain will be looking to progress into a full-time midfielder during the season. Smith’s bottom-age year was headlined by his 44 disposal, 13 inside 50s and 10 clearances game against Western Jets in Round 14 of the 2017 TAC Cup. Another player that will feature heavily in the Dragons’ pursuit for success will be North Melbourne father-son prospect Joel Crocker (son of Darren). The rangy hybrid midfielder impressed last year at school football for Brighton Grammar playing in defence and is a good ball user by foot. The agile Crocker missed the latter parts of the Dragons 2017 campaign due to an ankle injury, but expect him to feature prominently this season. Nineteen year-old 200cm tall Joe Griffiths might be one to keep an eye on, coming to the TAC Cup club for the first time after the boarder performed well in the ruck for Geelong Grammar at school football, earning him a State Combine invite. Ethan Casey will also return from an ACL injury and will battle it out in the ruck alongside vice-captain James Rendell (son of Fitzroy and Brisbane ruckman Matt). There’s no doubting opposition teams will need to have plenty of tall timber to combat the Dragons team. Tom Long, Alastair Richards, Liam Stocker, Harry Houlahan and Ryan Macdermid are a handful of players who had experience as bottom-agers and they will be looking to progress their football in 2018. 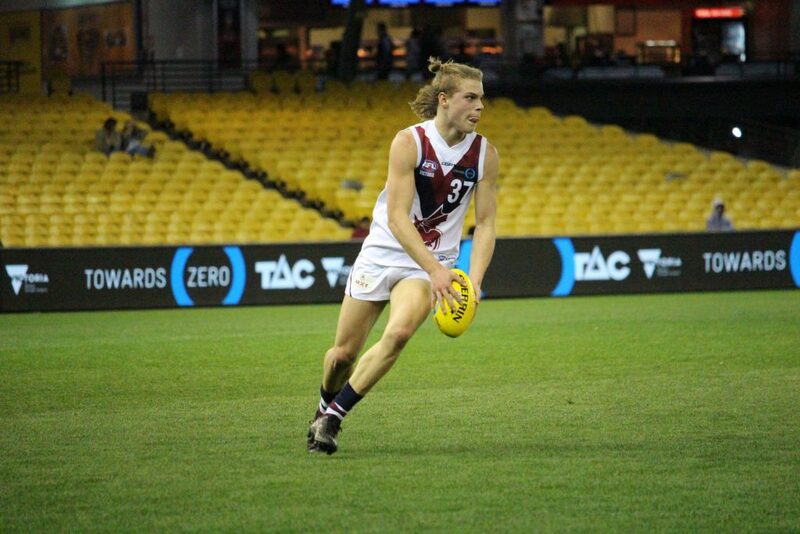 Angus Hanrahan (brother of Hawthorn’s Ollie) is another player who performed well at school football for St Kevin’s College in 2017, and might be a player to track during the year. Alongside Hanrahan, Rendell and Crocker – there are some other familiar last names down at the Dragons with Finn Maginness (son of Hawthorn premiership player Scott), Jai Florent (brother of Sydney’s Ollie), Jeremy Goddard (brother of St Kilda’s Hugh), Jackson Voss (son of former Saint Brett) and Tyson Milne (son of former St Kilda goalsneak Steven). The Dragons were not far off back-to-back premierships in a see-sawing TAC Cup Grand Final that saw them come from 20 points down at three-quarter time to nearly storm home and get the win, after Geelong Falcons small forward Gryan Miers booted seven goals. They begun the season with a bang at Ikon Park, with bottom-age forward Max King bagging six marks and booting four goals. Hamish Brayshaw returned in the second half of the season after VFL commitments for Sandringham Zebras and used his power in the middle of the ground to push the Dragons side deep into the finals, eventually helping the 19 year-old find himself on an AFL list by the end of the year. Although they lost some games throughout the season that they ultimately should’ve won, the ‘next man up’ attitude at the Dragons saw them able to cover their losses during the season when the APS and AGSV school football commitments popped up. The Dragons begin the season at Skybus Stadium in Frankston against Northern Knights, before playing the Oakleigh Chargers and Calder Cannons before school football season kicks-off. If the Dragons can win all three winnable games, it should set them up for the season that will see them juggle plenty of squad members as best as they can. With the Dragons’ strong squad, if they can avoid having to play off during the ‘Wildcard’ round in the lead up to finals, they should be able to progress deep into September for yet another year.